Audio Concepts, Inc. (ACI) is one of the best kept secrets in audio. This is due in part to the ingenuity of ACIs owner and chief designer, Mike Dzurko. Several years ago Dzurko decided to completely do away with his advertising budget. Currently, ACI relies on word-of-mouth sales, online referrals and the business it generates from its web-site. Well, they must be doing something right, because they seem to be perpetually back-ordered. Sales have certainly remained brisk at ACI. Although ACI is not well known, it nevertheless seems to generate a high rate of customer satisfaction. They offer great value to their customers, and excellent service to boot. Since ACI has no retail distribution and is sold factory-direct only (with a 30-day return policy), they are able to offer their products at a lower cost. Unlike some other companies that claim to "pass the savings on to you," ACI actually does. For the past few years my reference for a stand-mounted monitor speaker has been ACIs Sapphire III, which sells for $999 a pair. They are fully competitive with speakers that sell for double the price. Ive been equally enthralled with ACI Titan, a 12-inch, 200-watt subwoofer, which sells for approximately $800. Both have taken permanent residence in my home. While many products have come and gone, this combo has remained. When I learned that ACI had introduced the Opal, a new floorstanding speaker, I approached them for review samples. It also seemed like a good opportunity to investigate the newly introduced, smaller bookshelf monitor called the Emerald. What better way to kill two birds with one stone than to incorporate them into a home-theater system? Mike Dzurko promised that all the speakers in the line have matched voicing and they would combine to form a seamless surround system. The Opal is a handsome, floorstanding, two-way speaker priced at $849 per pair. This 38-1/8" tall by 10-1/8" wide by 13-1/4" deep speaker is a sealed design and is constructed of 3/4" MDF. It weighs in at 58 lbs. and is internally braced. Standard finishes are lacquered oak, black lacquered oak or clear lacquered cherry. Custom veneers are available at extra cost. My review pair was finished in cherry and it was beautiful. With rounded corners and a first-class finish, these speakers look much more expensive than they really are. The Emerald is a diminutive speaker only 11-3/4" tall, 7" wide and 7-3/4" deep. Still, it tips the scale at a beefy 15 lbs. The cherry lacquer is particularly handsome. It is shielded for use as a center-channel speaker. ACI specifies a "Premium egg-shell satin smooth, durable black finish" as standard ($290 each), with oak or cherry finishes optional. Each speaker is priced at $290 and $340 respectively. In order to get a handle on the basic characteristics of the speakers, the first thing I did was slide them into a music system. This system consists of a Classé 5 preamp and CA100 power amp with a Sony DVP-S500D DVD player feeding a Meridian 563 DAC. Wires and cables were DH Labs Silver Sonic T-14 speaker cables, BL-1 interconnect, and D-75 digital coax. To help me gain perspective I brought out a pair of NHT SuperTwos, a fine example of a $750 per pair floorstanding speaker. 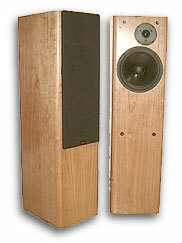 While the two speakers sounded more alike than different, what set them apart was the upper-bass/lower-midrange region. Where the NHT is a bit on the lean side through this region, the Opal was considerably more "rounded" in its presentation. It had a fuller and warmer character than the NHT. Subjective bass extension between the two speakers was just about a dead heat, which boded very well for the Opals. However, the aforementioned leanness of the NHTs mid-bass gave them the subjective edge where bass articulation was concerned. The NHTs sounded just a tad bit more detailed down there. But scrappy devils that they are, the Opals counter- punched with a fuller, more robust presentation that I presume many people will prefer. In direct comparison, the midrange on the NHTs may initially seem more detailed, but this is something of an illusion, again relating to that propensity towards being lean. Listen to the Opals for a while and you will begin to realize that all the pieces are there, and the additional warmth does not obscure nuance and detail. Trebles were very close in character with the Opal being slightly smoother and a touch more laid back. Overall, the Opal had a softer and more forgiving personality than the leaner, meaner NHT. Imaging was very good with the Opals, but in my music room I had a slightly more difficult time getting them to sonically disappear. Eventually I found that they prefer to be placed a little closer together relative to the listening position than most speakers (more on this later). As good as the Opals are, the Emeralds are, excuse the pun, the real gems here. While they dont have the bass "oomph" of the Opals, they have essentially the same voicing without the added warmth. The sound is decidedly cleaner and a hair less colored. At roughly two thirds the cost of the Opal, this tiny speaker has a small inert box that frees it from cabinet resonance and diffraction effects, which allows it to image like crazy. When you consider the relative prices between the two speakers, you must also consider that the Emeralds require stands. So while I may heap more praise on the Emerald, the fact is that the two speakers are not really competing on a level playing field. The Opals may be the overachievers here. Im really jazzed over the Emeralds, which are superb little performers. With or without a subwoofer, they remain well balanced with none of the spit and sizzle that plagues many speakers in this price range. On the contrary, the treble is smooth and sweet. Midrange is very clean and almost on par with its larger brother from ACI, the Sapphire III. Imaging is very good, as you would expect of a mini-monitor. They also vanish visually and sonically compared with the Opals. I did have one bone to pick with the Emeralds. As finely finished as they are, there is one slight flaw that has nothing to do with performance. I am referring to the way that the grills attach. The face of the speaker is drilled with four holes, one in each corner. Into each hole is inserted a soft rubber grommet. The grills bulbous feet are inserted into those grommets. When I removed the grills, some of the grommets pulled right out of the speaker, requiring them to be removed from the grill and reinserted into the speaker. While this is hardly a fatal flaw, I hope that ACI can fix this single blemish on its otherwise excellent design. Of course, the real object here was to evaluate the ACIs as a theater loudspeaker system. The Opals took position as my front right and left speakers with Emeralds taking center channel and rear duties. I also used my own ACI Titan subwoofer. I placed the Opals twenty-four inches from the front walls and about twenty inches from the side walls. Distance between the Opals was exactly six feet, as measured from inside-speaker-walls. Between them, twelve inches from the front wall, was the Emerald. The speakers in the rear were placed eighteen inches in from the side walls, fifteen inches from the rear walls, and elevated until the tweeter was fifty-five inches from the floor. Components used were my Yamaha DSP-A1 amplifier, a Marantz LV520 Laser Disc player and a Sony DVP-S500D DVD player. One of the first things I wanted to do was assess the bass capabilities of the Opal in the context of the theater. Im happy to say that given judicious use of the volume control, the Opals handled the task fairly well. But, even in my medium sized room if I got a little crazy with the volume it was not hard to over-drive the 8" woofers. For instance, in the "Big Shoe" scene from Antz, each footfall should be a real seismic event. First, I watched it at my usual volume setting, with the subwoofer properly adjusted and the processor set to "small" front speakers. With the ACI Titan in the system it was wonderful. I then advanced the volume to see how the sub handled the scene at an even higher setting. Again, I was very pleased with the system performance. Bass was fast and tight with plenty enough impact for a satisfying experience. Then, in an effort to judge what I would be missing without the sub, I removed it from the system. I set the processor to "large" front speakers with the LFE channel being routed there also. Without adjusting the volume from this elevated setting, I repeated the scene, which clearly overdrove the woofers on the Opals. What I got was more sonic hysterics than real bass as the drivers hit their stops. However, somewhat surprising was how little bass "doubling" I got. Pitch remained about on target but low-bass shudder was gone. So, I returned the volume setting to my comfortable listening level and tried the scene again. Im pleased to report that at my more reasonable listening level, the Opals performed admirably. While not possessing the weight of the Titan, they nonetheless successfully energized the room with real bass. The "wrecking ball" scene was another successful test with the Opals handling bass duties by themselves. Having ascertained that the Opals could shoulder the responsibility of bass in a theater (either permanently or in the interim until funds allow the purchase of a real subwoofer), it was time to return to the Titan and enjoy the benefits only a real subwoofer can provide. "Thank You For Sending Me An Angel" from the Talking Heads Stop Making Sense DVD proved an excellent piece by which to judge the voice matching between the Emeralds and the Opals. The scene opens up with a camera doing a slow semicircle around Chris Frantz and his drum kit. As the visual perspective changes, so does the origin of the music. You can hear David Byrn and Tina Weymouth slowly pan from the right channel, through to the center, and on to the left channel. On the ACI system, the pan was a complete success with no obvious changes of timbre. The movie Antz further demonstrated the timbre-matched system, especially during the underground scene where the worker ants were busy with pick-axes working away at the walls. First came the initial "whack" at the wall from center screen, followed immediately by the sound of crumbling rocks and dirt all around, including from the rear channels. Again, there were no signs of a mismatch here. Indeed, the Emerald proved to be an excellent center channel for use with the Opals, as well as the matched surround speakers. In the middle of the review period, something rather interesting happened. I took delivery of a pair of speakers I had purchased for my personal use. I inserted these new speakers into the theater room (with their own electronics) by moving the Opals four inches from the side walls with a heavy degree of toe-in. I placed the new speakers between the Opals and the center channel speaker. A few days later, I sat down for some casual listening to the ACI system and was astonished at what I discovered. I had expected to hear greatly diminished midrange detail, some upper-bass/lower-midrange congestion and a deteriorated soundstage as a result of the new, closer, proximity to the side wall. None of it was true. As a matter of fact, the speakers absolutely and completely disappeared into the room and the soundstage was expansive. Im not exactly sure to what I should attribute this performance, but all I can suggest to people with a long and narrow room is to give it a shot. Particularly when listening in surround, it was quite enjoyable. During my time with the ACI system I watched a lot of movies and enjoyed several concert videos. Id love to tell you all about the revelations that the ACI system gave me, and how they allowed me to hear into the program material as no other system Ive ever heard, but I cant. Ive used too many fine systems and speakers in this room. On the other hand, at about $2500 for the two Opals, three Emeralds and my Titan, this is the second cheapest 5.1 channel speaker system Ive had through here. That it could even hang with the memory of these recently departed systems without disappointing, indicates its fine quality. I thoroughly enjoyed my time with this system. Particularly on movies, I cant say that it was deficient in any significant way. As a home-theater system, the Audio Concepts Inc.s Opal/Emerald combo proved to be a very capable and enjoyable system. One of the most basic requirements of speakers designated for the home theater is that they be voice-matched for a seamless surround presentation. In this area, the ACI combo succeeds admirably. Though the Opals and Emeralds are voiced similarly, they are not equivalent speakers. While the Opal saves on speaker stands (you dont need them) and gives you near full-range sound, the Emerald would be my choice for a more expensive (they do require a subwoofer and stands, after all) system intended as much for music as movies. Either way, for the money invested, you get performance at least on par with some of the best products in their respective classes. Whatever your priorities, I highly recommend the ACIs for their fine sound as well as their great looks, low price, and flexibility in system configuration. And if they are back-ordered, be patient, theyre worth the wait!